This Hubble Space Telescope photo shows the galaxy cluster MACS J1206, which is warped by gravitational lensing. Warped visions of distant galaxy clusters are offering a reflection of the invisible matter inside them that astronomers are using to map the unseen side of the universe. 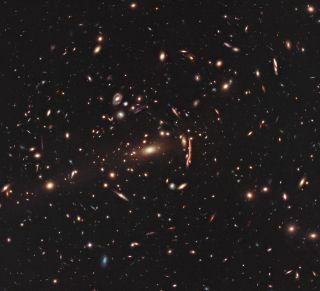 Using the Hubble Space Telescope, astronomers have observed the first of a number of galaxy clusters that they hope to use to build a cosmic census of hidden dark matter. Dark matter, thought to make up 98 percent of all matter in the universe, cannot be seen, only felt through its gravitational pull. To find out where dark matter lies, and how much of it there is, scientists look for an effect called gravitational lensing. This bending of light is caused when mass — including dark matter — warps space-time, causing light to travel a crooked path through it. The end effect is a curvy, funhouse-mirror type view of distant cosmic objects. Scientists are planning to observe a total of 25 galaxy clusters under a project called CLASH (Cluster Lensing and Supernova survey with Hubble). One of the first objects observed for the new census is the galaxy cluster MACS J1206.2-0847. This conglomeration of galaxies is one of the most massive structures in the universe, and its gigantic gravitational pull causes stunning gravitational lensing. In addition to curving of light, gravitational lensing often produces double images of the same galaxy. In the new observation of cluster MACS J1206.2-0847, astronomers counted 47 multiple images of 12 newly identified galaxies. By conducting the survey, astronomers are attempting not just to weigh these distant behemoths, but to learn more about when and how they formed. Theory suggests that the first galaxy clusters came together between 9 billion and 12 billion years ago. Some previous research suggests that dark matter is packed more densely inside galaxy clusters than previously thought. If the new study can confirm that, it may mean that the universe's galaxy clusters formed earlier than most scientists assume.